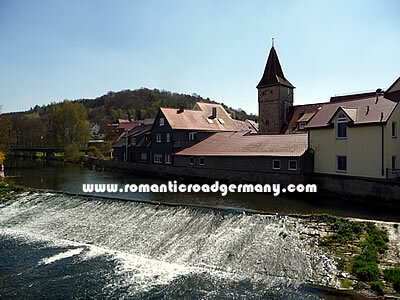 Creglingen is a small and attractive town set in the Tauber valley in southern Germany with access to some spectacular countryside of vineyards and woods in the hills around the historic centre. 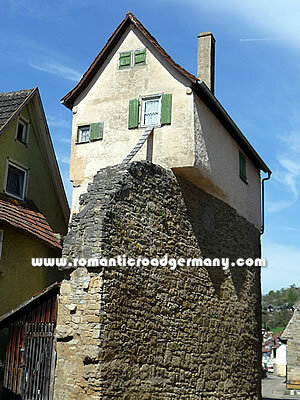 It is the first main "Romantic Road town" in the Tauber valley after Rothenburg ob der Tauber, which is to the southeast. Further along the valley are the towns of Bad Mergentheim, Lauda and Tauberbischofsheim. For such a small place, Creglingen has a number of museums and historic sights in the town and in the villages surrounding it. One of the historic sights near Creglingen - the remains of a Celtic fortification wall near Finsterlohr - gives an idea how long there has been settlement in this area. Creglingen itself was given the charter as a town in the 14th century, although the first written mention of it as a settlement came a good three centuries earlier. One of Creglingen's most historic buildings - the Herrgottskirche (the "Church of Our Lord") - was built in the mid-14th century after a farmer is said to have found an undamaged communion host in the field that he was ploughing. The church is located about one kilometre to the south outside the historic centre of the town. It is most famous for its wooden altar by the woodworker Tilman Riemenschneider which is considered as one of the most valuable examples of religious altar carving in the Middle Ages. A Thimble Museum is located nearby. Like its neighbours, Creglingen had a regular change of overlords because of its strategic position near borders and on trade routes and belonged to Prussia and Bavaria before eventually becoming part of Württemberg and what is now the state of Baden-Württemberg (it is still very close to the border with Bavaria) in Germany. An infamous part of Creglingen's history was that it was the location for the first pogrom resulting in the murder of local Jewish inhabitants (which included local town councillors) in the 1930s. Nowadays the Jewish cemetery outside the town can be visited and there is a Jewish Museum in the centre of Creglingen which gives an insight into the history of the Jewish community in the town. The photo at the top of this History section is of the Lindleinturm. The bottom part is a section of a watchtower in the town wall from the Middle Ages. The "house" on top was built by the owner of the tower at the end of the 18th century. The building was opened as a museum in 1999 and shows how the last inhabitant of the rooms above the tower lived.